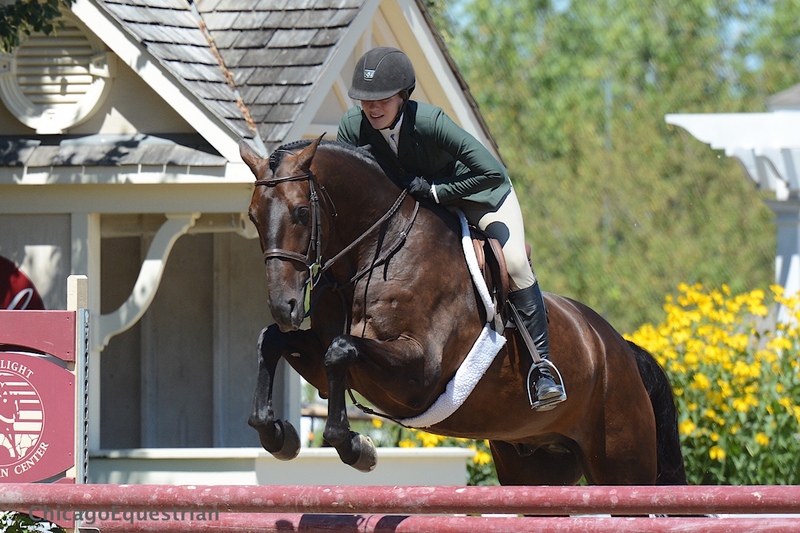 Becky Kozma and Alex Trolli's Del Piero won the $1,000 Junior Hunter Classic. Photo Chicago Equestrian. 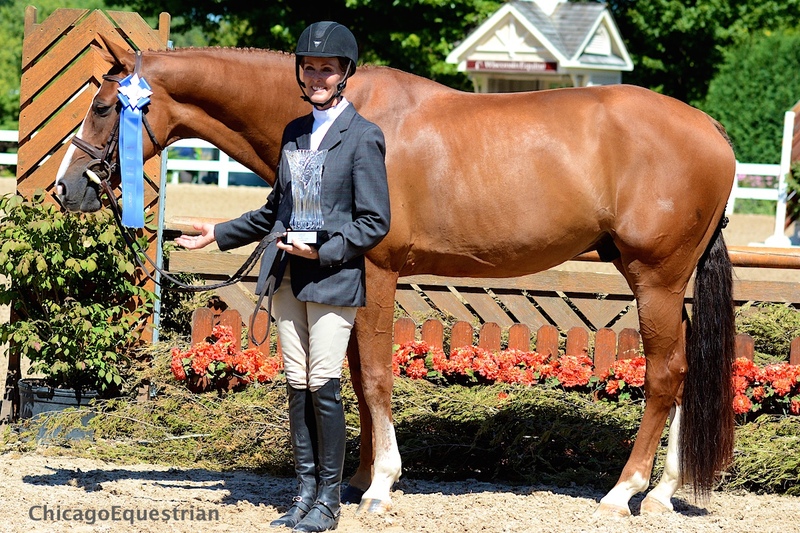 Wayne, IL – July 31, 2015 – Junior and Amateur Owner Hunters took their turn in the Wisconsin Equine Main Hunter ring at Lamplight Equestrian Center during Equifest II. 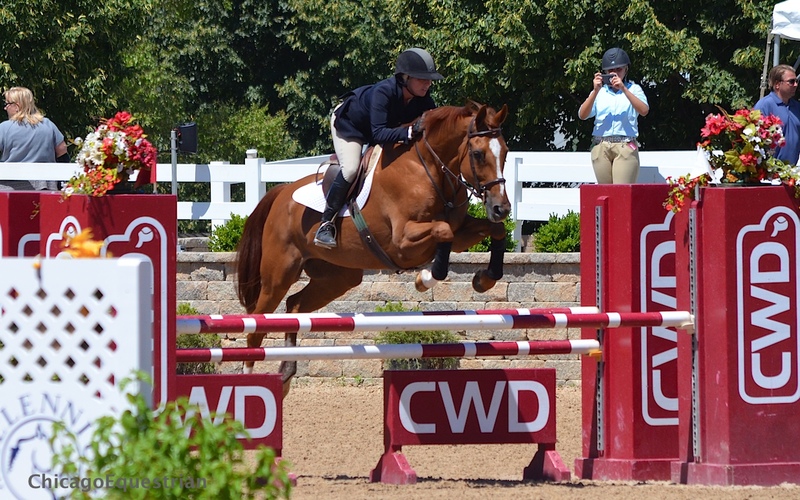 Hunter riders had two over fences classes and the $1,000 Classic for each division today. 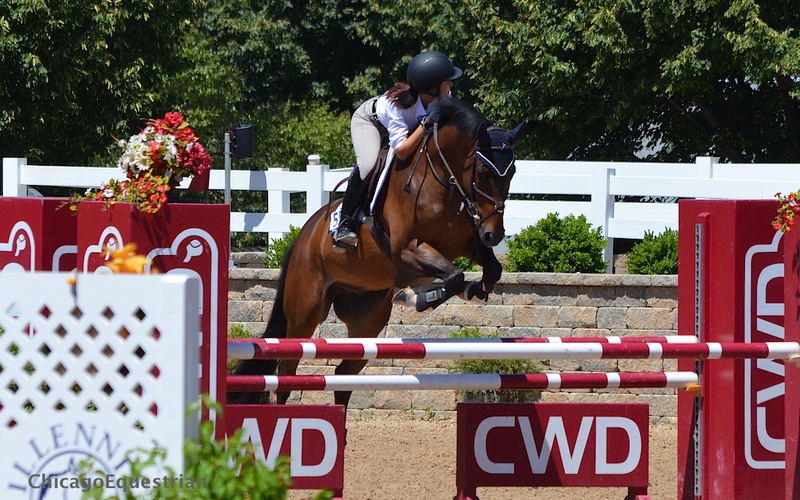 Both 3’6” and 3’3” sections had their chance to earn World Championship Hunter Rider points this week, setting the stage for the $5,000 USHJA National Hunter Derby and the $25,000 USHJA International Hunter Derby, which take place on Sunday. The SmartPak Grand Prix ring hosted Children’s and Adult Jumpers and Low and High Junior Amateur jumpers, preparing for Classic day tomorrow. Grand Prix horses had the day off before the big show on Saturday, featuring the $50,000 Grand Prix and the $30,000 Jumper Derby on Sunday. Olivia Lawton and Balin. Photo Chicago Equestrian. 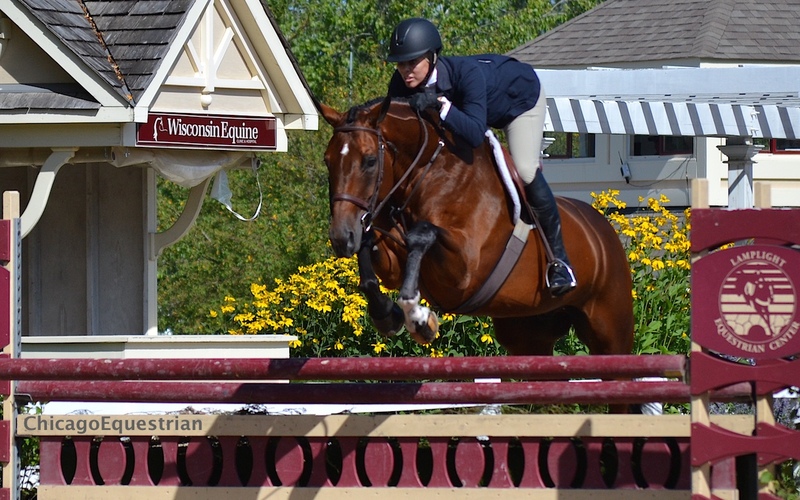 Olivia Lawton, Burr Ridge, IL, stole the show in the 3’6” Junior Hunters between her three rides. Lawton rode Balin to the win in the first class and her Outlook and Gretzsky, were second and fourth. Olivia Lawton and Gretzsky. Photo Chicago Equestrian. Lawton’s own super star, Gretzsky, was the star of the show in the second class, with Outlook third and Balin fourth. Lawton, 17, rides with trainer Lynn Jayne in Elgin, IL. The team has been hitting the road hard, since this is Lawton’s last junior year. They attended the Junior Hunter Finals, where Lawton finished 10thoverall on Gretzsky and 7th on Outlook. They headed to Chagrin Valley Ohio and then on to Traverse City, where Lawton landed the Junior Hunter Championship on Balin. “No matter how busy Lynn is, she’s always on time to the ring. At home we don’t jump much so we work mostly on flatwork and I think that has really made me a better rider. She (Lynn) is tough but I get a lot out of the lessons,” added Lawton. Lawton also rides in the jumpers and the equitation. She is already qualified for the Maclay regionals and is one point away from qualifying for the Medal. She is looking into NCAA teams for college where she will study business and continue riding. Becky Kozma and Hey Sailor. Photo bChicago Equestrian. In the 3’3” Junior Hunters, high school senior Becky Kozma of Streamwood, IL, was an understudy for SBS Farms’ junior rider Alex Trolli, and got the opportunity to perform on Hey Sailor and Del Piero. Kozma catch rode her way to win the first class on Hey Sailor, owned by the Buffalo Therapeutic Riding Center. 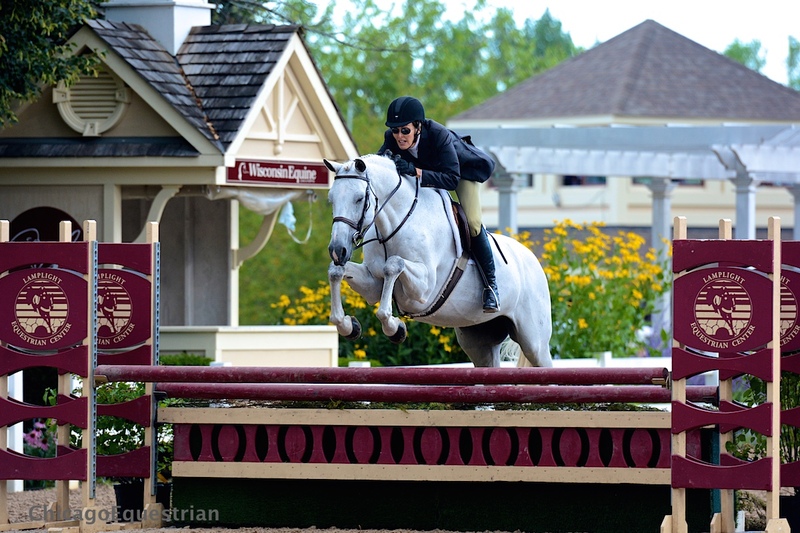 Kozma was second in the second junior hunter class on Del Piero, owned by Alex Trolli. Madison Arani and Wonderful Look, owned by Sweet Oak Farm were the winners of the second 3’3” Junior Hunter class. Kozma returned for a curtain call with Del Piero to receive the award and photo op for their win in the $1,000 USEF Junior Hunter Classic. Lawton and Gretzsky took home second and Kozma and Hey Sailor earned the third place prize. Margaret O'Meara and Casino. Photo Chicago Equestrian. In the 3’3” Amateur Owner Hunters, Margaret O’Meara whisked away the top two places in the first class with Casino taking the blue and Solitaire taking second. Reid Patton and Sincere were the best in the second class with Angela Swanson and Savile Row earning the second place spot. MTM Passport and Therese Peck won both 3'6" Amateur Owner classes. Photo Annie Weeden. Therese Peck and MTM Passport owned the 3’6” Amateur Owner Hunters, winning both over fences classes. Heather Zuber and Kalifornia took both second place ribbons back to the barn. Margaret O'Meara and Solitaire won the $1,000 Amateur Owner Hunter Classic. Photo Chicago Equestrian. The USEF $1,000 Amateur Owner Hunter Classic honored all of today’s top horses in the top five spots with O’Meara’s Solitaire with the lead role and the highest score, MTM Passport and Peck took second, Kalifornia and Zuber were third, Patton and her Sincere were fourth and O’Meara’s Casino in fifth. In the Children’s Hunters 14 and under, My BFF with Erin Cummins aboard won both over fences classes today. In the Children’s Hunters 15-17, Contadina, owned by Arkham Investments and Keely Bieniak took a first and second today and Natalie Alden and her King of Hearts won the second class. 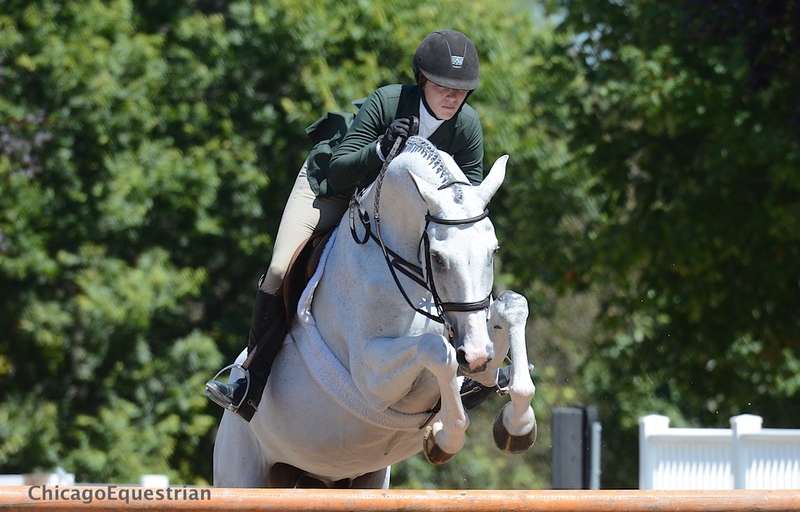 Claire Stockard and Bombadier owned by John Pappas won the WIHS/NAL/M&S Children’s Hunter Classic. The performances continue tomorrow with handy rounds and under saddles for the championship titles. 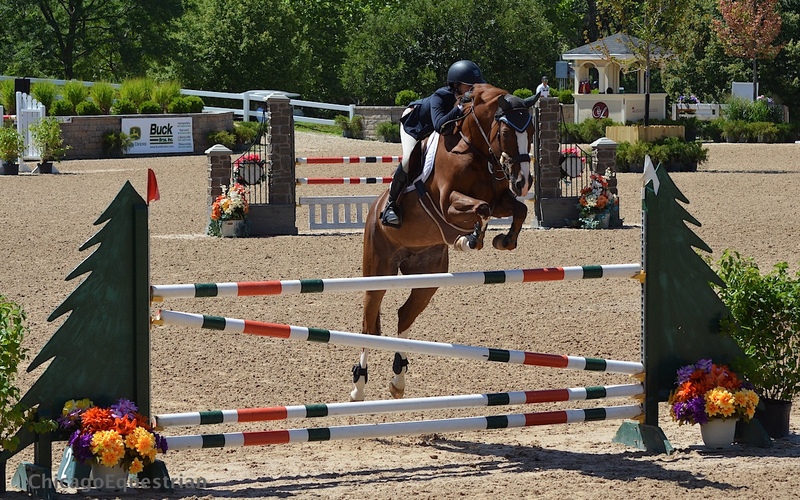 Competition continued in the SmartPak Grand Prix ring with the $1,000 High Junior/Amateur Owner Jumpers. The trend set yesterday continued, with riders facing difficult courses in their attempts at the top ribbons. Reid Patton an Zoe Velvet. Photo Ellizabeth Stein. Reid Patton of Nashville, TN, took the first and second place honors. Patton was the only rider to make it to the jump off where she delivered a clear round with 34.282 seconds on the clock with her mare Zoe Velvet. She took second aboard Twister, having a single time fault that kept them out of the jump off. These are two familiar rides for the sophomore at Duke, who had to catch a red-eye into Chicago from San Francisco to make it for her class. Patton has been partnered with her 15-year-old Twister for three years and 10-year-old Zoe Velvet for two. Patton had nothing but praise for her two mounts, admitting they are a bit different in temperament. “Twister has been my steady eddie go-to horse and has a huge bounding stride. Zoe Velvet has been rising through the ranks. She’s stronger than I’m used to and was hard for me to ride initially, but she’s really been stepping up,” remarked Patton. The course, like yesterday’s, proved difficult for riders, with rails falling throughout, but Patton was unfazed. “I thought the courses were designed well and were really fair and straightforward. The jump-off was great for me because Zoe Velvet is more of a galloper than a turner,” said Patton. 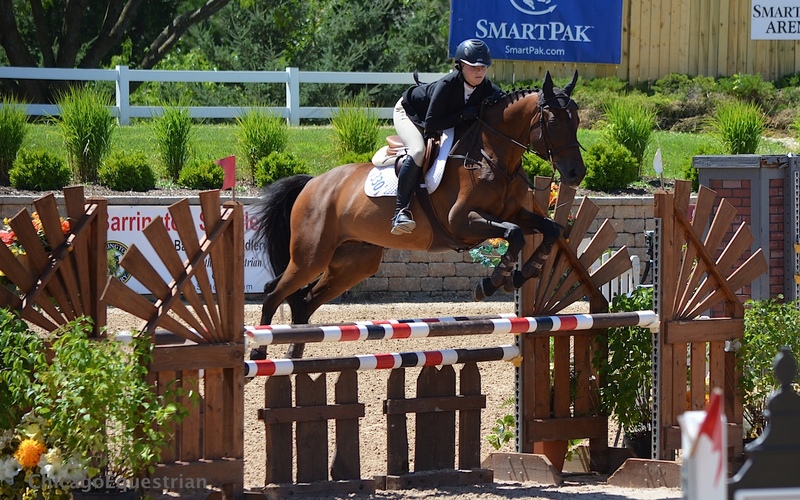 Patton will compete in the $7,500 Cavalor Show Jumping Hall of Fame High Junior/Amateur Owner Classic. Olivia Pollina and Bravoman. Photo Elizabeth Stein. 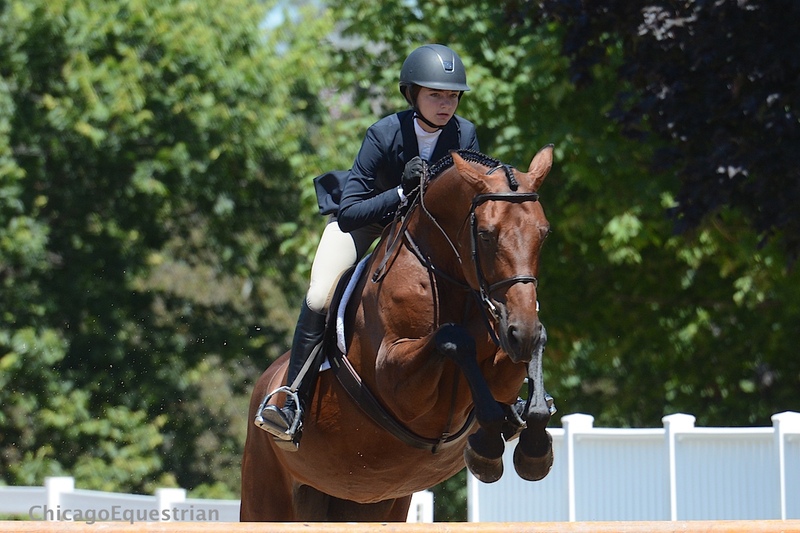 In the Low Junior/Amateur class, Olivia Pollina from Barrington Hills, IL, took the victory with Bravoman. Pollina was one of four to go double clear, laying down an unbeatable time of 30.660. The second place spot went to Mauricio Restrepo aboard Boston, who went double clear with a time of 32.449. In the Child/Adult Jumpers earlier in the day, twenty-five adults and eight children galloped for the first prize finish. On the Children’s card, the win went to 15-year-old Barrington Hills native Gigi Spence. Gigi Spence and Bambino. Photo Elizabeth Stein. Spence, who only started riding her partner Bambino this past January was ecstatic about her win. Spence admitted it was hard going later in the order and having to watch and wait for her turn. “I get nervous the more I have to watch. I walked the course and just tried to stick with my plan,” remarked Spence. When asked about her mount, Spence had nothing but compliments. “He’s quick off his feet and very lovable. Everyone says he’s a hard horse but I got along with him right from the start. When I first tried him I was a little nervous but now we get along great,” joked Spence. Spence will be competing in tomorrow’s $1,500 Child WIHS/NAL/M&S Classic. Heather Zuber and Phoenix. Photo Elizabeth Stein. For the Adults, Heather Zuber of Zionsville, IN, had the win aboard Phoenix. Zuber went early in the order and delivered a double clear effort that was enough to hold the lead all the way through. Following her closely in second was Anna Filipowski aboard Wonder Boy Van De Katershoeve. Jumper competition continues Saturday with a day filled with classics and the $50,000 Grand Prix at 4:00 pm.